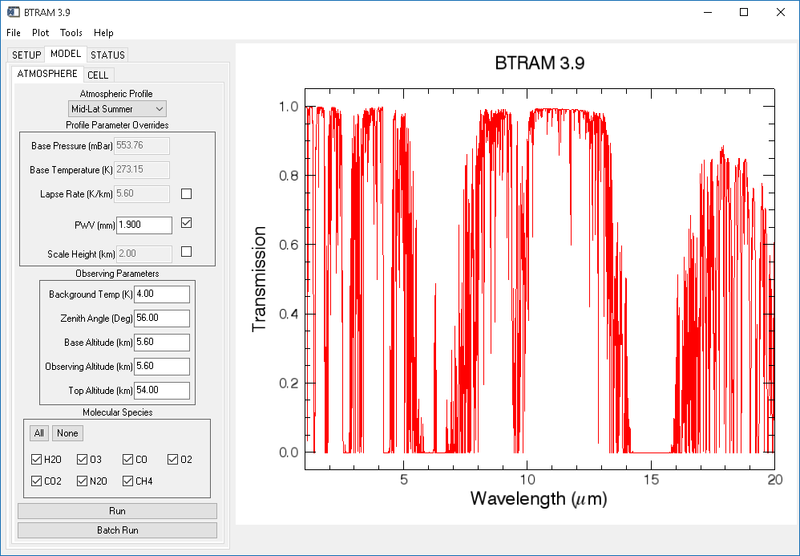 BTRAM, the Blue Sky Spectroscopy Transmission and Radiance Atmospheric Model, is a fast, fully customizable, line-by-line, layer-by-layer radiative transfer model based on the HITRAN 2012 molecular line database. The product of over 15 years of development and testing, BTRAM provides line-of-sight transmission and emission spectra for fully customizable atmospheres and gas cells over wavelengths ranging from the visible to the extreme infrared at variable spectral resolution. Running on a PC, BTRAM quickly produces accurate results through a convenient graphical user interface. Transmission, emission, and opacity are modeled along a line of sight for radiation at wavelengths above 500nm. The user can specify the spectral resolution of the model, limited by the available RAM and computation time. The model spectrum can be convolved with a user-specified instrument line shape. The user has a choice of modeling radiative transfer of an atmosphere or simulated gas cell. The Earth’s atmosphere is modeled in three different sections: 0 to 12km, 12 to 30km, and 30 to 50km. Within these sections, atmospheric layers can be customized by the user. Nine pre-defined atmospheric profiles are included, six of these are equivalent to the standard atmospheric models found in FASCODE. The atmospheric model has been successfully validated against FASCODE. Radiative transfer through a gas cell allows users to select a mixture of gases from a list of 37 common gases, or simply to model a short path of atmosphere at constant pressure and temperature. The particular strength of BTRAM is to provide results quickly through a flexible and user friendly interface. Simulations can be based on individual parameter selections or on a batch process that iterates through a one-dimensional parameter space at a user-defined interval. The Graphical User Interface allows users to click to zoom into results and auto-scale axes. Commonly used units (cm-1, GHz, μm, nm) are available for the spectral dimension. A comprehensive online help system and a stand-alone user manual are available. Results can be printed and stored in ASCII or the open SPC® data format. BTRAM runs under the IDL Virtual Machine® on Windows XP, Vista, and Linux. The purchase of third-party software is not required. Installation of the self-contained application is straightforward. Send email to btram@blueskyinc.ca for a license quote. Download the latest version, BTRAM 3.9, now. Detailed description of the radiative transfer model from the original thesis work. Querel et al. 2008 model the transmission through the atmosphere at the site of the Las Campanas observatory and compare it to measurements with an optical echelle spectrograph. Spencer et al. 2004 model the transmission through the atmosphere in the instrument test and integration facility to analyze data from the ground test campaign of the Herschel/SPIRE instrument. Chapman et al. 2004 model the transmission through the atmosphere above Mauna Kea, Hawaii, to validate an infrared radiometer against SCUBA.